There's a celebration in heaven tonight and the dearly departed is remembered sweetly with this uplifting and comforting expression of sympathy. 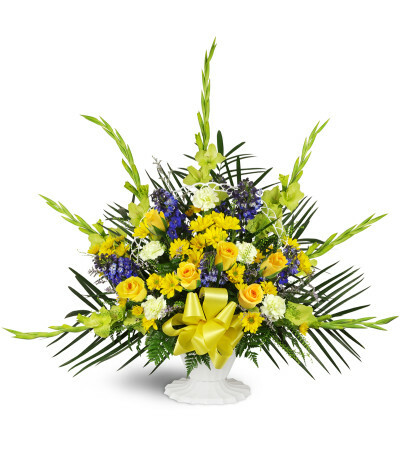 This gorgeous arrangement of gladiolus, yellow daisies and distinctive blue delphinium is wonderful for remembering men or women. Arranged with lovely seasonal greenery this beautiful sympathy gift will soothe the grief of family and friends. A graceful white tribute basket with fluted foot details is filled with blue delphinium, yellow daisies, and distinctive gladiolus. Includes a yellow bow accent. Best florist around! Great arrangements & great service. Beautiful arrangement!! They do a terrific job!! Their arrangents are over and above other florists I've tried. I don't have to look anywhere else from now on. Tuckahoe Florist is a Lovingly Florist in Tuckahoe. Buying local matters. Discover how Lovingly supports local florists. Copyrighted images herein are used with permission by Tuckahoe Florist.